Every week I get asked about the best Meet Edgar alternative for evergreen social media scheduling. I like Meet Edgar, but it’s expensive for most small business owners. 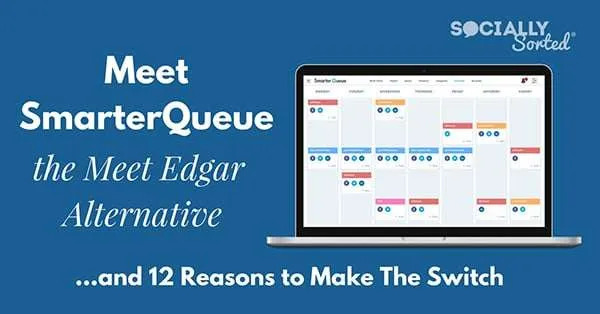 In this post I share my review of SmarterQueue and why you should consider making the switch to this solid Meet Edgar alternative for scheduling your content. I used Meet Edgar for a couple of years to schedule content on an evergreen basis, mainly on Twitter, but you can also use it for LinkedIn and Facebook. Meet Edgar raised their price from $49 to $79 USD which started the onslaught of questions from my community…asking me every week: is there an affordable Meet Edgar Alternative? It’s interesting that they then dropped the price of Edgar again (most likely due to said backlash about said price-rise), but they remained the most expensive tool of its kind (which is a big thing for many non-Americans when we are juggling the exchange rate). Meet Edgar also does content automation only. It is not a social media management tool, so you can’t engage with content.. you can only post it. Even with all that in mind, I went looking for an alternative to recommend to my community – many of which had ruled out Meet Edgar because of the price point. So let me introduce you to a great alternative. It turns out SmarterQueue does all of the things that Edgar was doing and more. Category Based Scheduling – this is where Meet Edgar shot to stardom when it was first released. Scheduling within categories gave us new superpowers to control what content “type” went out “when” and on what platform. Pause Feature – for me this was a no-brainer. I loved that Edgar allowed me to pause the entire queue when there was a national disaster or sensitive news. I didn’t want to be tweeting insensitively. 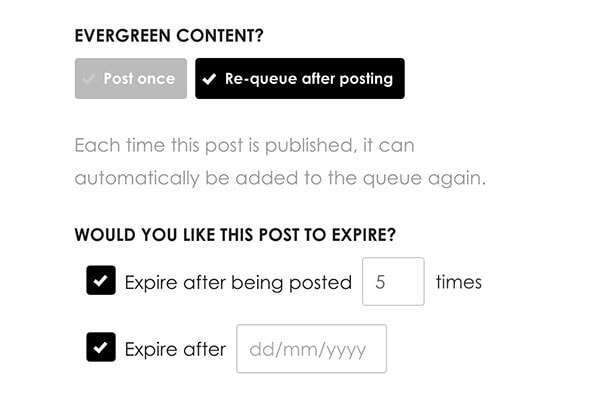 Re-Queue of Evergreen content – this is becoming more and more necessary as we try to post our content out on multiple platforms. I don’t mind automation like this as it frees me up to engage (which is what it is all about, right?). Update: now that Twitter has new rules for automation of content, it needs to comply with their guidelines for repeated content on Twitter. You’ll see below how SmarterQueue are handling this. Unlimited Posts – or near to it! With Meet Edgar I could post many times throughout the day under different categories/schedules. Multiple Platforms – although I used Edgar mainly for Twitter, I like that you can use it for Facebook and LInkedIn too. Browser Extension – for quickly adding content that you stumble across and want to quickly add to your queue. 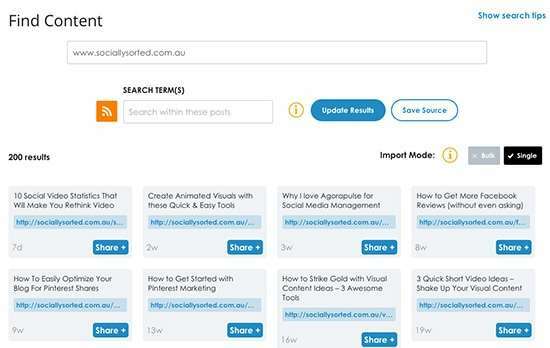 Short LInks – the ability to convert your links to short links like bitly’s. Date-based content – whereby you can set your content to expire by a certain date or only post a certain number of times. Great user interface – Edgar was easy on the eye, so I didn’t want to recommend a clunky complicated replacement. That’s right. It pretty much replaces all of Meet Edgar’s functionality … but with cream on top. 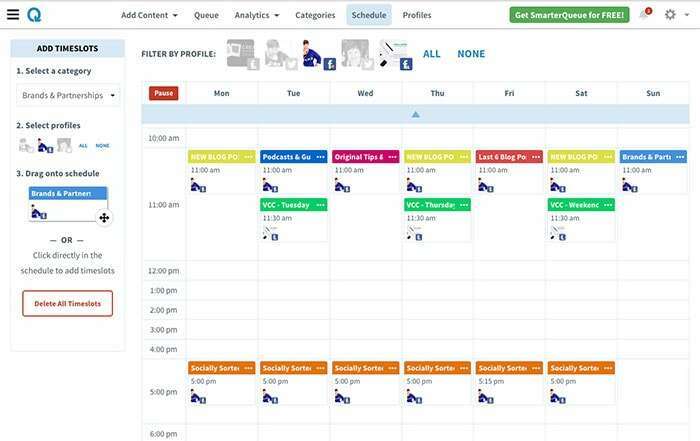 SmarterQueue ticks all the boxes for being able to schedule evergreen posts, have unlimited posts, schedule to multiple accounts (Twitter, Facebook Pages/Profiles/Groups, LinkedIn and Instagram), and category-based scheduling to name a few things. With any evergreen queue tool, the set up of your categories and schedule can be daunting. I remember the first time I did this in Meet Edgar, it took a while to get my head around all the moving parts! Once I got started, it became easier, but still took a lot of time. You’ll literally be guided through, step-by-step, in setting up your account and populating categories – making for a great on-boarding experience. 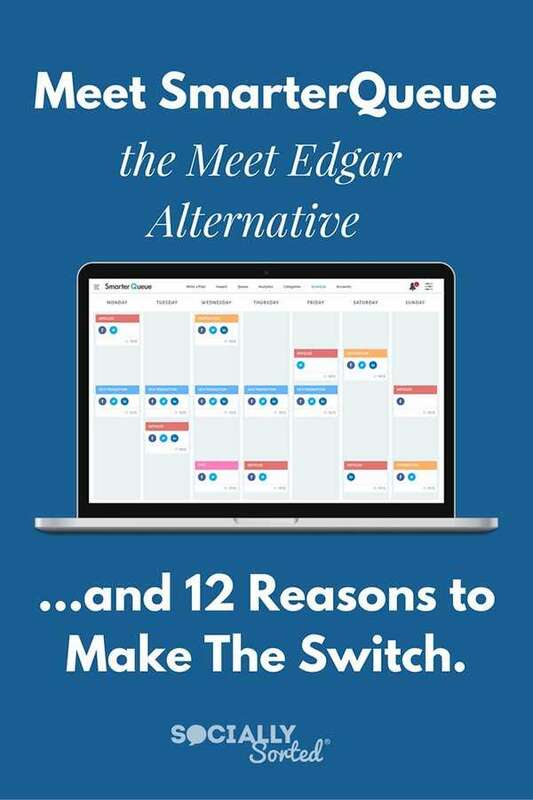 The problem with switching to a new tool as a Meet Edgar Alternative is that you really don’t want to go through the process of setting up your schedule again. 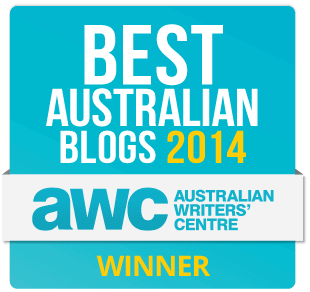 One of the challenging tasks you have is to work out the best times to schedule your content. But with SmarterQueue it was set up pretty quickly. If you are starting out for the first time, you can set up your categories manually with new titles and time slots as in the video above. It’s very drag-and-drop and super easy to populate your queue times slots. Or if you are transferring from another tool, SmarterQueue gives you a helping hand to import your queue from Edgar (or another tool). SmarterQueue analyses your social profiles and then re-creates a posting schedule based on your existing schedule. then you just have to allocate categories to those posts and you’re done. It’s easy to assign categories to timeslots. It really is like “painting”. SmarterQueue allows you to colour-code your categories so it’s a quick click of the mouse and you can add a colour-coded category to any timeslot. Once you start adding content to timeslots on ScheduleQueue, it’s super fast to fill out your schedule with the categories you set up. A feature I love on SmarterQueue (which makes it a great Meet Edgar alternative) is the colour coding. It makes it so much easier to find, move, schedule and edit content. Migrating to SmarterQueue from another scheduler doesn’t just stop at setting up your schedule queue and adding categories to that queue. You have to add content to your categories. This was the part that nobody ever looks forward to – especially if you have added soooo much content in Meet Edgar or another tool. It’s one thing I always had hesitations about when it came to setting up so much content in Meet Edgar. They gave you no way of downloading it all later in order to transfer it. So if you are put off by the sheer magnitude of switching from Meet Edgar. Fear not…it’s easy. 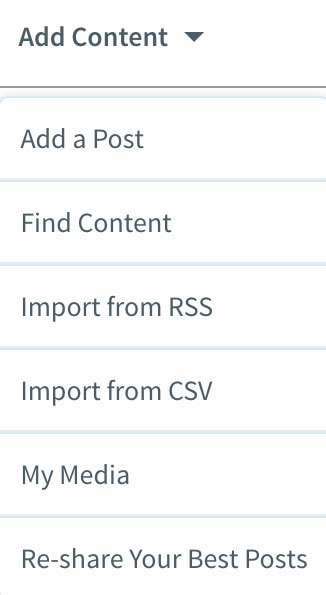 Use this to simply add a post or search for other types of content such as importing from an RSS feed (for your blog), importing from a CSV, your media, or existing blog posts just to name a few. SmarterQueue gives you content ideas for repurposing old content and where to find new content – everything from importing old blog posts to using hashtags and how to search for suggested content. Adding a fresh, new post to SmarterQueue is fun. You can easily add images to your post and then schedule to post immediately, or to repeat your content. It’s as simple as adding your description, URL and then choosing what type of image or extra features you want. 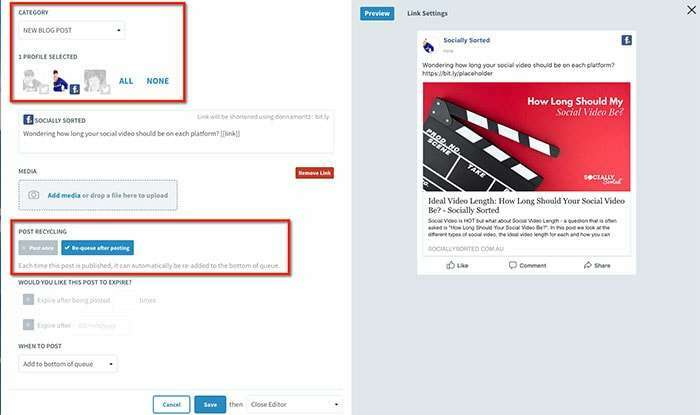 For example, when adding a blog post to Facebook, SmarterQueue will load the link and description and show the image that will be shared in a visual preview. What about the new rules for Twitter? 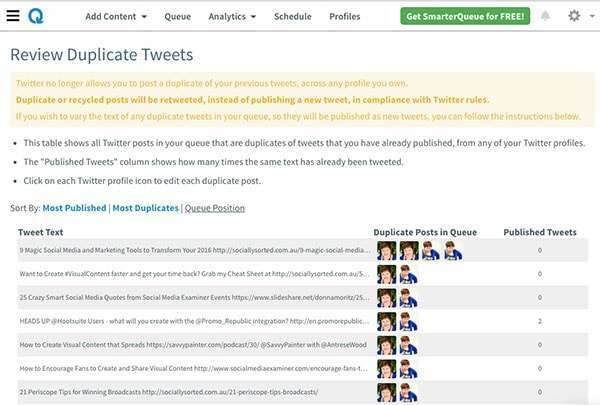 SmarterQueue have stated that they will continue to recycle tweets by installing a fall-back: If your content is recognised as duplicate in the queue, then SmarterQueue will retweet the 2nd and subsequent duplicate tweets after the initial posting. This way it is not posted in duplicate but is instead retweeted from your account. Put simply, the first tweet will go out as usual, and then any duplicate tweets after this are automatically posted as a retweet. This workaround may comply with the guidelines but I am not a huge fan of retweeting my own tweets, so I would only recommend using this as a fallback if you miss a duplicate tweet (consider it your safety measure). I wouldn’t plan my whole strategy around retweets. SmarterQueue themselves have also told me that this is a fall-back action to avoid duplicates being posted, and to catch any that fall through the cracks. They are working on a more comprehensive alternative (see below). SmarterQueue has a second tool to help us with avoiding duplicate content. 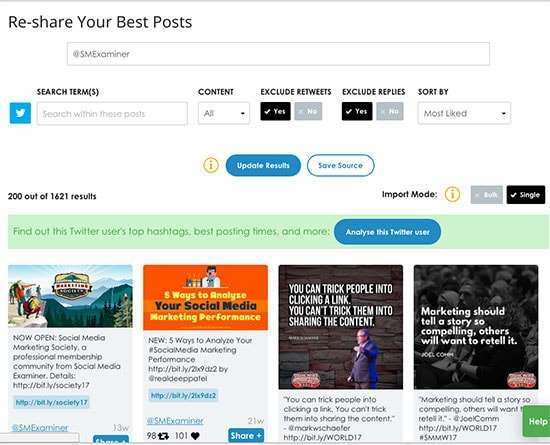 This tool allows you to review your duplicate tweets. It scans any tweets you have in your queue that show up as duplicate and if you leave them in the queue and don’t modify them, they will be posted as a retweet. if you’re like me and you don’t want to rely on retweets you can use this tool to zoom in on the tweets that need to be changed up, and change their content to comply. In the image below you can see an example. I just need to click on any tweet to edit the hashtag, image, text or emoji or any combination of content. Once you get practiced at it, it’s easy to re-phrase a tweet into unique content. And besides, it makes sense to vary your content in order for people to notice it. 3 What features are coming? SmarterQueue will be adding a new feature that will make it easier to add multiple “variations” of a tweet including text and media variations (across all platforms, not just Twitter). This will also allow you to split-test content on any platform. You will also be able to extend the period of your repeated content without having to use retweets (phew!). But if you choose Advanced Link Options you can add another pretty awesome function, UTM codes. This is a feature that wasn’t available with Meet Edgar but opens up a world of opportunities with SmarterQueue as a Meet Edgar alternative: detailed UTM options. 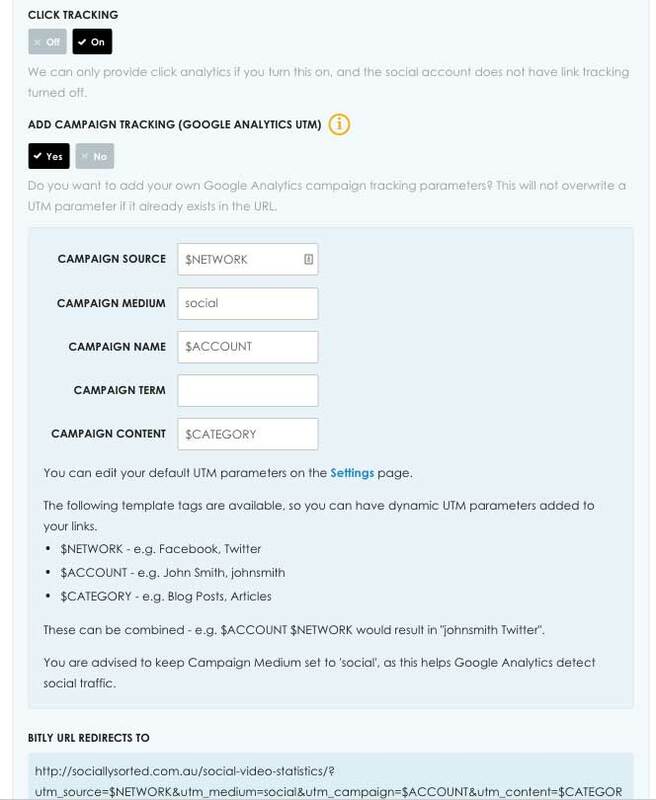 UTM parameters are tags that you can add to a URL so that when someone clicks on the URL those tags are sent back to Google Analytics for tracking. You can add any link with UTM parameters in SmarterQueue but advanced features allow you to add Google Analytics UTM as well. Now you can track every social post and know where your traffic is coming from based on content in SmarterQueue. You can easily search and find the content that is performing best and add it to your library. If you want to share content from your favourite pages and profiles, this allows you to do it easily! 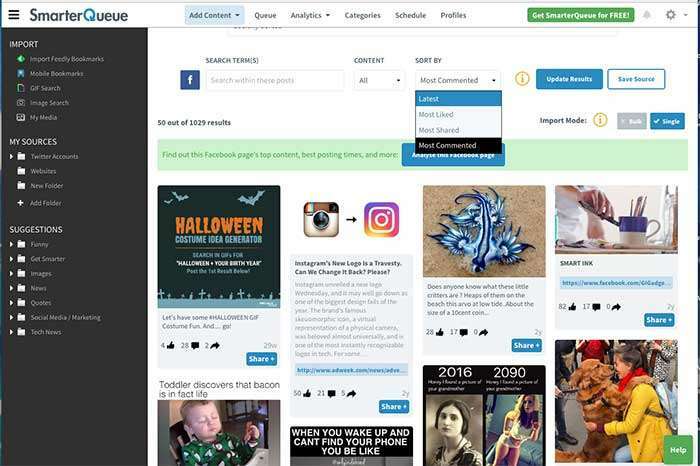 .For example, if you use the Add Content > Re-Share Your Best Posts feature (shown above), you can search for the most popular posts on any platform. Note that now if you do this for Twitter, you would need to change up the content of the imported tweets so that they comply with Twitter rules for duplicated content. But we will get to that below. Whether it’s an account name, username, keyword or a hashtag, you can use SmarterQueue to see what type of content is being engaged with the most (on your own platform or another brand or business you want to share content from). Then use that information to share it or to create your own content. You can also filter your searches by content type. You can even bookmark your favourite sources to use again. This is something that was missing with Meet Edgar – being able to find content to share from other sources. I love this feature on SmarterQueue – the search function is awesome and makes it a great Meet Edgar alternative. As well as Facebook, Twitter, and LinkedIn (Pinterest is apparently coming), SmarterQueue allows you to schedule your posts for Instagram. You then receive a notification to post, which makes it super easy to do your Instagram marketing. With Meet Edgar, one of the features I loved was being able to hit a button and pause my queue. This was handy if it was a national holiday or I wanted to avoid tweeting when an event or sensitive issue meant that it wasn’t appropriate to be tweeting a lot. The good news is that SmarterQueue has this feature and more. You can actually pause your entire queue or just a certain category or account. It’s this sort of granular control that really impresses me about SmarterQueue. 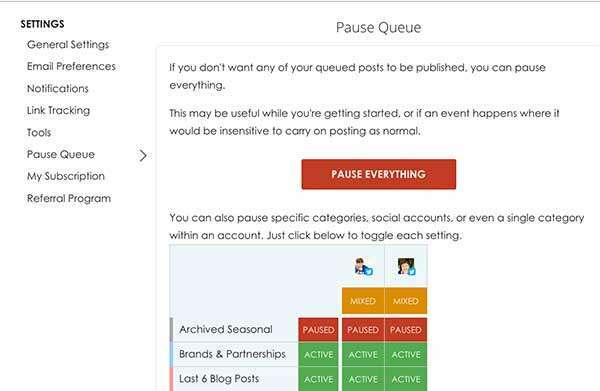 If I want to pause some seasonal content I can… which is super helpful. Features like this mean that SmarterQueue is not so much a Meet Edgar alternative, but more like an upgrade! SmarterQueue has a cool feature where it locks in the maximum number of posts on a platform (to avoid being flagged for spam). It will flag your account in SmarterQueue if you need to add more varied content or time slots or to add or change up your content. In short, they don’t want you to repeatedly spam your followers with the same stuff because you didn’t bother to update your queue… or you are promoting too much. It’s something I did not realise that I was missing with Edgar. 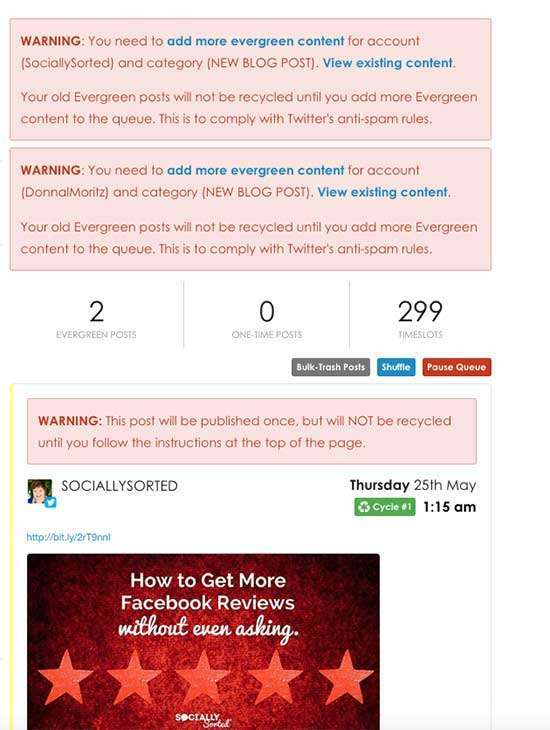 With evergreen queue tools it is very easy to fall into the trap of “setting and forgetting” our content. SmarterQueue ensures that you have the right amount of content and don’t over-schedule or repeat content too much. Detailed Twitter Analytics – including hashtag results, posting times and engagement based on type of content. Switching from Edgar to SmarterQueue is almost worth it for the stats! Maybe it is the way my mind works, but I find SmarterQueue to super easy to use. I think it is because of the colour coding. My mind thinks in categories and the colour coded categories and features make it so much easier to make sense of. And it’s a slick dashboard and user interface, so it’s nice to look at. SmarterQueue is also very “drag-and-drop” so you can easily move content around dashboards and timeslots. Last but not least, the price. Perhaps the biggest reason to consider SmarterQueue as a Meet Edgar alternative (though now that you can see the features, you know it’s about more than price). Click here to view more details on SmarterQueue’s Pricing. Unfortunately when you compare features and benefits, both tools are good but SmarterQeue blows Meet Edgar out of the water when it comes to price and additional features. 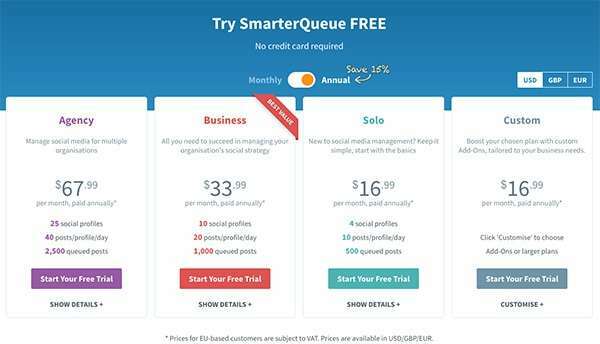 Edgar is back down to $49 per month, yet SmarterQueue is as low as $16.99 USD per month (for 4 social media accounts) – which is enough for most small businesses. If you want to go up to 10 social media accounts then SmarterQueue is still affordable at $33.99 (half the price of Edgar). In fact SmarterQueue have actually reduced their price recently. I rest my case! Ready to give SmarterQueue a spin? I’ve partnered with the team at SmarterQueue to offer you an extended 30 day free trial (and you don’t need to enter your credit card details to do so). Grab Your Free Trial Here. HOT TIP: If you are not sure about using SmarterQueue as your Meet Edgar Alternative yet, then don’t stress about bringing over your content. Start with a different platform, schedule some new content and see how it works on a small scale with a smaller number of timeslots and posts. Then when you love it (C’mon, you have to admit it looks pretty good, right?) then you can think about migrating your content over to SmarterQueue. Add Native video to your scheduled posts in the queue. Search for millions of GIFs on Giphy and images on Pixabay and Unsplash. Search GIPHY, Unsplash and Pixabay as well as your own images within the dashboard. Now you get even greater access to great content that you can share on an evergreen basis with Smarterqueue. I used to think it was a great alternative to Edgar… now it’s pretty much blowing Edgar out of the water for cost and functionality. Check out all the new features here. 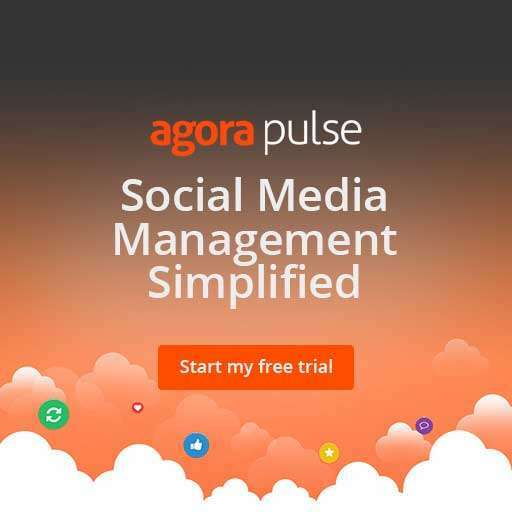 Need More Social Media Management Functionality? 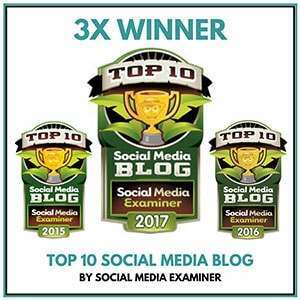 If you are looking for an all-compassing solution for social media management (let’s face it, we don’t want to have any more tools than we need to), I recently reviewed 4 tools with queue functions including SmarterQueue, including a detailed breakdown of the Twitter rules and what they mean for you. Will you consider SmarterQueue as a Meet Edgar Alternative? What do you look for in an evergreen auto-queue scheduling tool? This post is contains affiliate links which means I may receive a small commission, at no cost to you, if you make a purchase through any link in this post. Have you Met SmarterQueue yet?